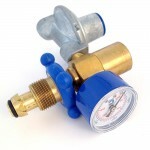 WineKeeper 2-Stage Regulator Without Quick Connect (P/N 59070). Used on the Magnum, Monterey, Monterey ETL, Napa, or Sonoma lines only up to any size. To hook up to a system, the Brass 90 (is used for table top non-refrigerated lines) or Metal Male Quick Connect is required for refrigerated units with heavier braided tubing (7919). This regulator reduces the cylinder pressure down to 5 psi gas pressure in the wine bottle. 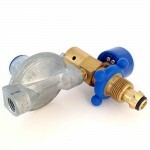 Used for refillable Nitrogen cylinders.